Plaque carved 1924 Memorial Rest Home,Nursing Sisters, Lindisfarne . Who was Nellie Payne? During the period between the wars, Nellie was called upon to design and carve a number of memorial objects for widely differing purposes. 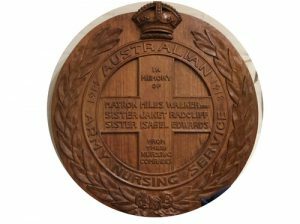 One of the earliest of these was a plaque for the Memorial Rest Home for Nursing Sisters at Lindisfarne in memory of Matron Miles Walker, Royal Red Cross, Sister Janet Radcliff and Sister Isabel Edwards who had all died while on active service during the Great War. For many years it occupied an honoured place in the Florence Nightingale Home. It is now featured in a display at the Anglesey Barracks Museum in Hobart.